Happy New Year’s wishes from Pacific Bridge Pictures! 2014 was an extraordinarily busy year, a bit too hectic for me to offer my regular posts, so I’m taking advantage of the holiday lull to make up for my absence and offer you a handful of reports this week on the current state of the Chinese film business. And if you’re interested you can read on to the end of this missive for a brief overview of the events that kept me busy. 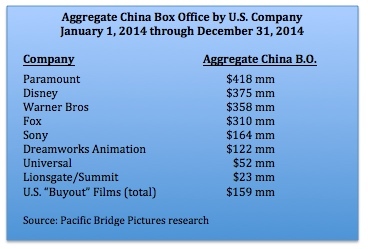 China was once again a major bright spot in an otherwise challenging year for the global movie business. While revenues for U.S.-made films declined in North America, Europe, Russia and other places in 2014, in China they rose by 33 percent to just over $2 billion. Most of the studios enjoyed the bounty, especially Paramount, which jumped from its last place ranking in 2013 to first among the majors, largely on the strength of the record smashing $320 million gross of Transformers: Age of Extinction. Although no other film came close to reaching the Transformers haul, most performed well, with the average studio picture grossing $65 million, a huge leap from last year’s $40 million average. Interstellar, X-Men: Days of Future Past, Dawn of the Planet of the Apes, and Captain America: The Winter Solider all exceeded $115 million. Only two films—The Monuments Men and Ice Age: The Meltdown—failed to crack the $10 million threshold. American sci-fi & fantasy titles drove nearly two-thirds of all the Hollywood majors’ ticket sales in the PRC, a giant shift from 2013 when they accounted for only 20 percent of the studios’ receipts. And U.S. animated films continued the impressive run that I noted back in March, nearly doubling their cumulative annual gross from 2013 to $273 million. As the Middle Kingdom’s share of the worldwide entertainment pie continues to expand, Hollywood is becoming increasingly reliant on China’s moviegoers, financiers and government policymakers to sustain its business. China now accounts for 1 of every 8 box office dollars spent around the world each day, up from 1 of every 125 a decade ago. 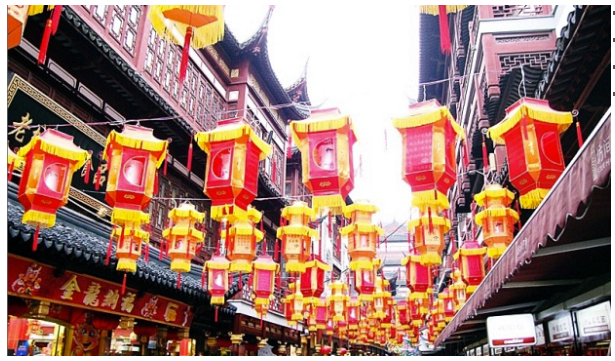 By 2020 China’s share will likely exceed 1 in 4. 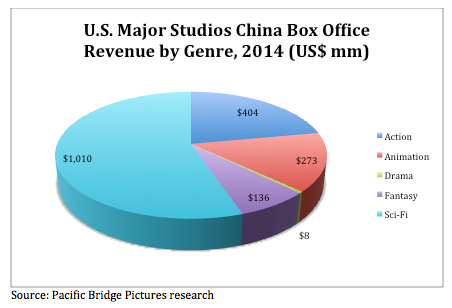 More and more the studios’ relevance and prosperity will depend on their skills in navigating the Chinese marketplace. As I mentioned above, 2014 was an extremely busy year for Pacific Bridge as we aided a dozen great clients on both sides of the Pacific in finding business and financial partners, entering new markets, raising capital, developing creative projects, and generally catalyzing business opportunities between China and the rest of the world. We are grateful for the opportunity to serve you. As for me, 2014 was an excellent year for deepening some great business partnerships ((you know who you are) and for some valued professional successes. A screenplay I wrote was chosen as a top 10 Finalist (from 7,511 entries) in the Academy of Motion Picture Arts and Science’s Nicholl Fellowship in Screenwriting competition, and with investors circling I expect we’ll get the movie into production this year. And together with partners I raised development funds and production financing from Chinese investors for three U.S.-based independent feature films, the first of which wrapped principal photography in November. More on those in a subsequent post. As always, I welcome correspondence from China Film Biz readers, especially those seeking help in understanding and exploiting opportunities in either direction across the Pacific. 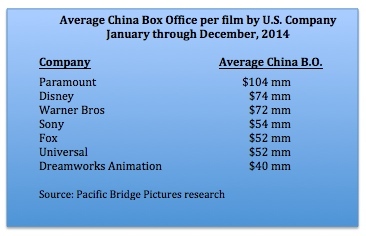 Drop me a line if you’re ready to make 2015 the year you strike it big in the China entertainment trade.